Opening day for the new health-insurance marketplaces is two months away, but efforts to recruit and train workers to help people enroll are barely off the ground in many states. With time running short before enrollment kicks off Oct. 1, the Obama administration last week cut back on training requirements for these ‘navigators.’ Officials were concerned there might not be enough time to do more-extensive training before the health-insurance exchanges open ... Three weeks ago, the administration said navigators would need up to 30 hours of training before they start, but it said last week that 20 hours would be sufficient. 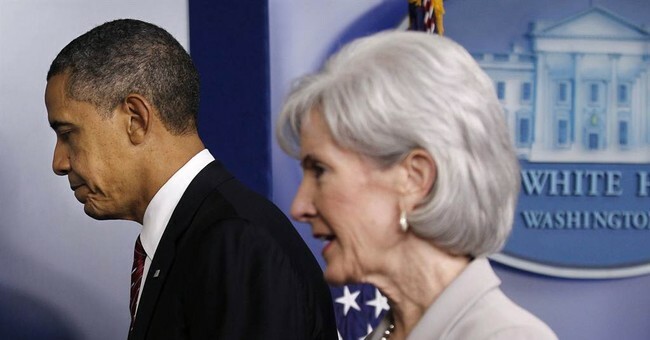 "Everywhere I go, I meet people who are excited about the marketplaces and hungry for information," Health and Human Services Secretary Kathleen Sebelius said Monday..."We are on target and ready to flip the switch on October 1," Sebelius said. We are ready to flip the switch! So long the "switch" doesn't include a bunch of stuff required by the law, and so long as the public is willing to experience random, unpredictable outages across the country for an unspecified period of time! Before you go, be sure to read Jonah Goldberg's column on Obamacare -- which mocks the Left for blaming the law's flaws on Republicans, condemns the administration's disregard for the rule of law (the president admittedly doesn't care), and offers some tactical advice to the GOP.